Athens, GA (Nov 13, 2007) - In an article by Cory McCartney of CNNSI.com, readers learn what goes on behind the scenes of a televised sports production. In this article he writes about a Raycom/Lincoln Financial Sports Production of a Georgia Tech football game in Atlanta. 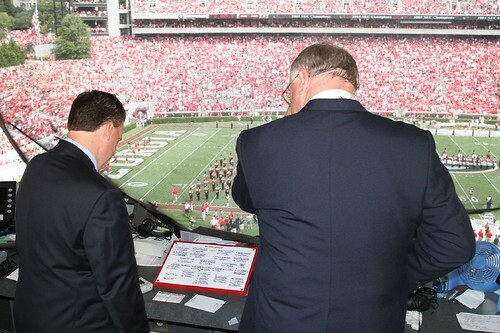 review player information before kickoff of a 2006 SEC telecast. Photograph Copyright 2007 by Christopher Byrne. All Rights Reserved. We've come to take the magic of delivering the game into our homes and favorite sports bars for granted. Sitting inside the Raycom/Lincoln Financial production truck, though, you quickly understand that turning the madness that takes place on and around the field into a seamless program is all about adaptation for the sake of continuity. All in all, it is a very good article and worth a read.